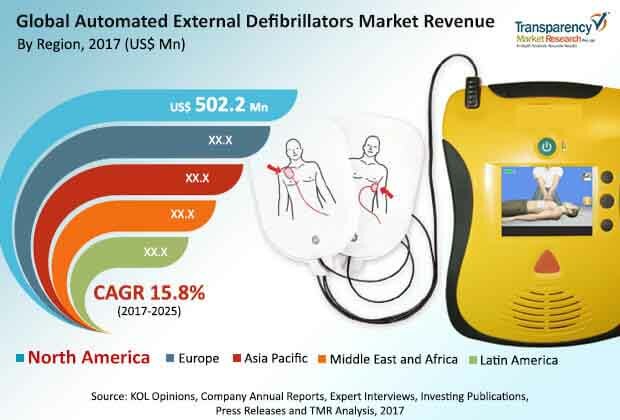 The global automated external defibrillators (AED) market accrues to the innovative strategies introduced by market players to capture a greater market share. The manufacture of automated external defibrillators necessarily requires a robust set of tools and specialised labor force to ensure that the final products are smart and nimble. Owing to this reason, the market players who have a strong fabric of resources have been able to produce effective products while the low-end manufacturers have failed to sustain in the market. It is expected that the ability of the market players to introduce better-performing and innovative products would define the scope of their growth. The leading market players are projected to resort to a range of extrinsic and intrinsic strategies in order to retain their dominance in the market. On the extrinsic end, the market players are anticipated to get into strategic alliances to enhance their prospects of growth. Furthermore, mergers and acquisitions are also foreseen as key business hacks for the market players who want to expand their consumer base. Amongst the intrinsic strategies, the market players are expected to hire skilled labor that can accelerate the production process and induct better technologies for agile manufacturing. Some of the leading players in the global market for automated external defibrillators are Koninklijke Philips N.V., Cardiac Science Corporation, GE Healthcare, NIHON KOHDEN CORPORATION, Schiller AG, Physio-Control, Inc. (Stryker), Asahi Kasei Medical Co., Ltd., and Shenzhen Mindray Bio-Medical Electronics Co., Ltd. According to a market research report by Transparency Market Research (TMR), the global market for automated external defibrillators is expected to expand at a phenomenal CAGR of 15.80% over the period between 2017 and 2025. The market was worth US$1,213.40 mn in 2016 and is projected to elevate to a stellar value of US$4,473.40 mn by 2025-end. The global healthcare industry has witnessed an escalating graph of developments over the past decade. This has given an impetus to the growth of the global market for automated external defibrillators. Furthermore, the changing lifestyles of the masses have increased the incidence of cardiovascular diseases, thus, necessitating the presence of automated external defibrillators across hospitals and healthcare units. During a cardiac arrest, immediate action needs to be taken to ensure that the heart’s normal functioning is restored, failing which, the affected person could die. Since automated external defibrillators sends an electric shock to the heart to restore its normal rhythm. Hence, the usefulness of these devices during emergency situations also propels demand within the global market for automated external defibrillators. On a geographical footing, the global market for automated external defibrillators is projected to witness paced growth in North America. The healthcare sector across the region has been fortified by the continual efforts of the government, which has given an impetus to the regional market. Furthermore, the incidence of cardiovascular disorders is also higher in North America which further necessitates the presence of automated external defibrillators across hospitals and healthcare centres.